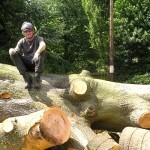 Ben Saxton Tree Surgery was founded in 2010 by Nottingham Tree Surgeon Ben Saxton. Ben was originally contracted by several Arboricultural companies across the East Midlands as a freelance climber and tree surgeon. During this time Ben soon gained a great reputation and began to receive enquiries for private work through word of mouth and recommendations. As they say, the rest is history, and Ben Saxton Tree Surgery was born! At Ben Saxton Tree Surgery we take great pride in our work and aim to deliver incomparable tree services to our customers and colleagues alike. Tree surgery is not just a job to us, it’s a lifestyle and we live and breathe it on a daily basis. The team are passionate about climbing and tree care, often attending climbing competitions and conventions to keep up to speed with the latest techniques and training development. Our work ethic is simple; get the job done and do a great job! Tree surgeons and companies requiring freelance climbers or climbing/lowering, kit safety inspections, aka LOLER examinations. Members of the public requiring domestic tree and arboricultural services for their gardens or land. Local council, business and corporate clients needing commercial tree care services.